Hugh Jackman finally gets to play PT Barnum in a very messy, occasionally transcendent musical. With as much historical detail as an elevator pitch the film tells the story of Barnum's rise from a poor tailor's son to the world's greatest showman. The plot is kept to a minimum as songs take the place of exposition and character as we breeze through the man's life and come out on the other side strangely feeling good. 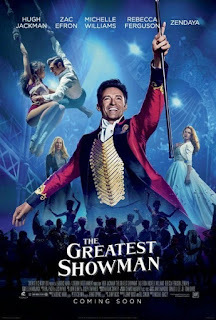 Much too short to ever hope to due Barnum's life justice, THE GREATEST SHOWMAN isn't really interested in being the story of the man but more a piece about finding family in unexpected places. Barnum and the people around him clearly bond and form a defacto family even when the world hates them. The film also is strangely about looking for happiness instead of money since everyone's fortunes rise and fall but as long as they are together they are happy. Yes I'm being snarky and I'm sorry. It's not because I dislike the film, I really do like it a great deal- more so when you consider that it it manages to generate goosebumps and tears during several musical numbers - This is Me and Rewrite The Stars in particular. My problem is a frustration with the film's plotting which doesn't allow for everything that the film is trying to do shine through such as the subplots such as the one involving racism. The film should be much longer to do it all justice. As it stands the film is a breezy musical tale with a couple of show stoppers that will make you feel good. Just don't look for anything too deep.